Nominated for Best Picture (Charles Roven, Jonathan Gordon, Megan Ellison, Richard Suckle), Best Actor (Christian Bale), Best Actress (Amy Adams), Best Supporting Actor (Bradley Cooper), Best Supporting Actress (Jennifer Lawrence), Best Costume Design (Michael Wilkinson), Best Director (David O. Russell), Best Film Editing (Jay Cassidy, Alan Baumgarten, Crispin Struthers), Best Production Design (Judy Becker, Heather Loeffler), and Best Original Screenplay (Eric Warren Singer, David O. Russell). David O. Russell is becoming an unstoppable director in recent years. 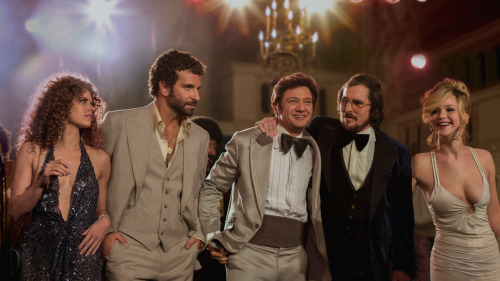 From The Fighter to Silver Lining’s Playbook, and now onto American Hustle, he groups his favorite actors together in this film to punch out another excellently made, sharp piece with similar humor that we all loved in Playbook. Christian Bale, Bradley Cooper, Amy Adams, and Jennifer Lawrence are the revisiting dream teams, but their performances are complimented this time by Jeremy Renner, Louis C.K. and other big names in the industry. The star studded cast combined with the fabulous director should be a recipe for greatness, and although the film took home zero Oscars on awards night, it was certainly a strong contender. The story is a little unoriginal and one we have seen often. It is the late 70s and early 80s. Irving Rosenfeld (Bale) is a small time scammer married to a young woman named Rosalyn (Lawrence). When he meets vivacious Sydney Prosser (Adams)–if that is her real name–he falls in love and ropes her into his business. They’re eventually cracked by the feds and ambitious Richie DiMaso (Cooper) offers them a deal to get off the hook. If they will help him to take town some big time scammers they’ll walk. Irving is a piece of work, and an excellent character, which is probably what attracted Bale to the part. The opening scene shows precisely how the man creates his masterpiece of a combover, complete with hair piece. He knows what he wants and how to get it but he also knows when things aren’t right. Sydney might turn out to be better than him, but I’ll let you decide on that front. The costuming is truly on point. Sydney is obsessed with the plunging neckline. Just as distracting is Richie’s head of incredibly curly hair (which he curls every night). Each character is so delectably unique, and yet somehow the story line doesn’t get bogged down with their loud, semi-insane character arcs and holds things together surprisingly well. Jeremy Renner plays the mayor, Carmine Polito, who is one of the many they are trying to scam. He is a big time family man who passionately wants to make a difference in the city, but unfortunately his methods are against the law and Richie is chasing after him. Irving and Sydney have no choice but to go along. Rosalyn is the loose cannon that could ruin the entire operation, and everybody knows it. Instead of keeping her at home, they continue to take her to all of the events and set her free. The big personalities are a recipe for disaster within the film, but outside of that, everything came together fairly well. Russell went at the con artist angle with more humor than we typically see. This is perhaps an attempt to make the plot more unique, but really it’s just a rehash of everything we have all ready seen out of Hollywood. Everything is executed well, as you can tell from the list of nominations, but what was missing was the twist of originality we typically see from the director and his star studded team. The film is rated R, but is a great comedy with a lot of wit, laughs, and ridiculous situations. I can appreciate this type of humor a lot more than something like “Ted.” If American Hustle sounds like something you would enjoy, I would definitely recommend it.